CYCLING: STUART Jameson was on the podium for the sixth time this season when finishing second at the LVRC National Circuit Race Championships in Milton Keynes. 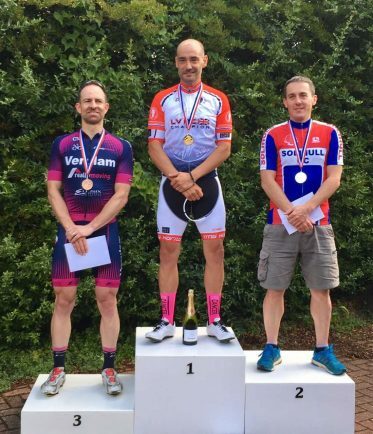 Chris Burns from Buckinghamshire bagged Gold while Jarad Millar from St Albans took the bronze in a race that attracted more than 55 of the country’s best veteran circuit race riders from clubs as far north as Manchester and south as London. The race was littered with incidents with the first crash taking place after three laps when one of the race favourites crashed heavily. The heavy impact appeared to have a sobering effect on the race as it took multiple laps before any further sprints took place. Jameson closed down a number of attacks and with five laps to go the leaders were tracked down, leaving the race to end in a bunched sprint finish. With one lap remaining, Jameson looked boxed in and at the back of the peloton. But a gap opened up on the outside as he jumped up to fifth wheel. On the final straight, Jameson jumped on to third wheel before the front rider tired. Hitting 65kmh,Jameson was overlapping Burns but the line came too soon and Burns took the win by a half a bike length. After the race, Jameson said: “I will definitely be back trying to grab the champions jersey next year and hope Solihull Tudor Grange Track might host the event. “This is my second year back racing after competing for Solihull as a school boy in the late 1980s. Visit www.solihullcc.org.uk for further information.